Robert Lyall Flock was born on 12 August 1928 in Buffalo, Erie County, New York. Lyall Harwood and A. Estelle Dorwin appeared in the US federal census of 1 April 1930 in Kenmore, Erie County, New York, at 119 Nassau Avenue. Other members of the household included Robert Lyall Flock, Ruth M. Harwood, Ruth Estelle Milander and Amelia (?). Ruth Flock and children are enumerated with her parents, while her husband Baldur is living in Buffalo with his mother. Baldur Andrew Flock and Ruth M. Harwood appeared in the US federal census of 1 April 1940 in Tonawanda, Erie County, New York, at 114 Woodward Avenue. Other members of the household included Robert Lyall Flock, Ruth Estelle Milander. The following was published online by the Buffalo Evening News: (Seattle, Aug. 27) Sixteen Buffalo and Western New York servicemen arrived here Tuesday from Korea aboard the Navy transport Marine Lynx. They are: . . . Sgt. Robert L. Flock, 114 Woodward, Kenmore. . . . The following appeared on 27 April 1965 in the Tonawanda News: A pair of Town of Tonawanda artists were among top winners in the 29th annual Western New York Exhibition at the Albright-Knox Gallery. The coveted Burge Award of $500 was won by Robert L. Flock, 114 Woodward Ave., art teacher at Hoover Junior High School. Mr. Flock's entry was an oil entitled "Dual." An abstraction, it features reds and greens boldly applied. Mr. Flock was notified last week that another of his paintings had been accepted for the Northeastern Regional Exhibit May 1 to June 6 at the Institute of Contemporary Art, Boston, Mass. He is the son of Mr. and Mrs. Baldur Flock. Mr. Flock attended Albright Art School and is a member of the Patteran Society of Artists. Top award for photography. . . The following appeared on 28 April 1965 in the Tonawanda News: A pair of Town of Tonawanda artists wee among top winners in the 29th annual Western New York Exhibition at Albright-Knox Gallery. Mr. Flock was notified last week that another of his paintings has been accepted for the Northeastern Regional Exhibit May 1 to June 6 at the Institute of Contemporary Art, Boston, Mass. He is the son of Mr. and Mrs. Baldur Flock. The following appeared on 29 June 1969 in the Buffalo Courier-Express: Hordes of women annually bring beauty to Erie County by raising flowers to grace libraries, church altars, hospital corridors and their own homes throughout summer. Another aim of many of these amateur horticulturists is to display the floral fruits of their backyard gardens at the flower show of the annual Erie County Fair scheduled Aug. 15 to 23 this year in Hamburg. Mrs. Baldur A. Flock is one gardener whose traditional "green thumb" has a rosy and violet cast. Mrs. Flock excels in cultivating both garden roses and exquisite African violets. The picture window of her home in Woodward Ave., Town of Tonawanda, is a perfect setting for uniform white pots of a variety of violets. Mrs. Flock grows tiny violets of palest lavender and flamboyant, large beauties having blossoms three inches wide. Colors run the gamut of every hue of purple, orchid, lavender, white-to-ivory, blue and pink. For good measure, she cultivated one plant that has both pink and purple blossoms. Feeding and watering her plants is a happy chore, although an arduous one. Mrs. Flock has 500 African violet plants. Most of them are under fluorescent lamps on racks in her basement. Mrs. Flock boasts a smaller "auxiliary" thumb. this one, green indeed, is the helping hand of Sean Pearson, 8, who resides across the street with his parents, Mr. and Mrs. Jack Perason. In September, Sean will be a fourth grader at Horace Mann Elementary School in Ralston Ave., Town of Tonawanda. Sean loves the violets, and cheerfully devotes most of his free time to helping Mrs. Flock carry plants to and from the basement. He helps package them for presentation as gifts. Sean also is learning the art of rose cultivation, and Mrs. Flock's garden is his proving ground. Sean shares one of Mrs. Flock's secrets. He knows she talks to her flowers. Few Gardeners admit indulging in floral converation, but Mrs. Flock says that some scientists believe plants react to music, to kind words and even to scoldings. She claims that many a lazily blooming violet has responded to her "Be pretty or out you go!" Mrs. Flock is founder of the Kenmore African Violet Society, member of the Niagara Frontier African Violet Society and accredited judge in the National African Violet Society. The couple's son, Robert L. Flock, teaches art at Niagara Community College. 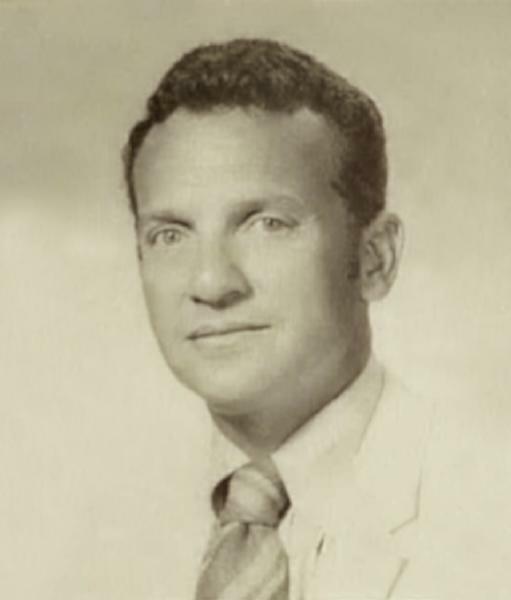 Her daughter, Ruth, is married to Dr. Frank L. Tabrah. The Tabrahs live in Kohala, Hawaii. Mrs. Tabrah, a novelist, is working on her third book. All the family knows exactly what Mrs. Flock is whispering to her violets these days. It's "Win a ribbon at the fair." The following appeared on 12 December 1970 in the Buffalo Courier-Express: [Died] Baldur A. Flock, Dec. 10, 1970, of the Town of Tonawanda, beloved husband of Ruth Harwood Flock; father of Robert L. Flock; brother of Albert Flock of Detroit, Mich. Funeral service from the Lester H. Wedekindt Inc. Funeral Home, 3290 Delaware Ave., Saturday afternoon at 1 o'clock. Friends are invited. Mr. Flock was a charter member of the Kenmore Lions Club, a Republican Committeeman and a member of Kenmore United Church of Christ. Those desiring, may contribute to the Memorial Fund of Kenmore United Church of Christ. Family will be present from 2-4 and 7-9 p.m. The following appeared on 28 December 1970 in the Lockport Union-Sun & Journal: Two Niagara County Community College art instructors have been awarded $1,600 faculty research grants by the State University of New York Research Foundation, Dr. Ernest Notar, president of the college, announced today. They are Robert L. Flock of Kenmore, who received a research fellowship, and Vincent J. Baldassano of Buffalo, who received a grant-in-aid. Both are assistant professors of art at Niagara County Community College. The grants will enable the two "to explore art innovations" during the summer months, Dr. Notar said. A Native of Buffalo, Mr. Flock studied at the Albright Art School and received a Yale fellowship for art study in 1958. He is a graduate of the University of Buffalo and taught at State University College at Buffalo. Appointed to the NCCC faculty Jan. 1, 1969 he has exhibited extensively in national art shows. The following appeared on 1 May 1981 in the Tonawanda News: The board of trustees of Niagara County Community College recently approved promotions and merit awards for four area residents. Being promoted are Robert Flock of Kenmore, to associate professor of art. . . The following appeared in the Buffalo News: [Died] Ruth Flock, age 98, of Kenmore, New York, formerly of Angola, August 29, 1998; wife of the late Baldur A. Flock; beloved mother of Robert Flock of Snyder, New York, Ruth Tabrah of Hawaii; grandmother of Thomas and Joseph Tabrah; also survived by 6 great-grandchildren. No prior visitation. Funeral services were held at the convenience of the family. Interment was held in Forest Avenue Cemetery, Angola, New York. Mrs. Flock was known as the "African Violet Lady" of Kenmore. Arrangements by Jay R. Addison. The following appeared on 24 September 2013 in The Buffalo News: This Friday, September 27, is the opening reception for Robert Lyall Flock’s exhibit “WORK,” in the Paul William Beltz & Family Art Gallery at Villa Maria College. The following appeared on 17 October 2013 in Artvoice Weekly Edition: The current exhibit at the Villa Maria gallery comprises representative work from four distinct phases of the mature career of veteran local abstractionist painter Robert Lyall Flock. The show is entitled Work, which is what he called many of his paintings. From the late 1980s are two large lands of unlikeness maps, oil on canvas, a little reminiscent of the intractable art of Clyfford Still. Fields of in one case blue-green, in the other orange, with jagged contrast areas poking through and breaking up the otherwise preponderant mood of uneasy composure, upsetting perforce serenity. And from year 2000, four bravura oil stick and acrylics on thick paper scribble works. Dense, dark, overlay on overlay tornadoes of multicolors, amid contrast areas of rainbow ranks of discrete crayon lines, sometimes straight, sometimes wavy, and occasional strips or stripes of what looks like color-saturated paper tape. In three of the works the scribble tornadoes are central and predominant. In one case, more polite and refined separate color lines occupy the center, dispersing the heavy weather scribbling to the periphery. Like dissipating storm clouds. Very different work the next year, 2001. Abstractionist still, but with more than a hint of subject matter. Two works from the artist’s Port de Lucie series. These are legible maps—not actually, but ideally—in distinct areas of different colors and contrasting patterns of fleck marks. And variously legible as geological—as land cut stratigraphic materials charts—and topographic surface maps. The look of stratigraphic charts—juxtapositions of different physical materials—but with a basic verticality not horizontality as to the arrangements. And with a fringe of what could be vegetation across the horizontal top of the depicted matter, between depicted matter and sky. The final group consists of three large-scale works in thinned paint and broad-brush gestural wash strokes, each work in a single dominant color, a variant of a primary color, a slightly pale blue, a pinkish red, and orange-yellow. Seen from across the room, these look to be watered acrylics, while from close on, they resemble encaustics. They turn out to be in oil on canvas. Unlike all the other works in the show, these paintings are not dated. In accord with a Matissean paradigm—the ideal of art as an armchair, but more essentially, art as ethereal, unadulterated work of the imagination, with minimal worldly fetters—this should be late work. Actually, according to exhibit curator Brian Duffy, it is early work, from the mid-1970s. Seeming to reverse the Matissean paradigm. Copious adventitious but unexpunged drip tracks of the generously applied thinned paint medium evoke the world metonomously through the effect of its fundamental and inexorable law of gravity. 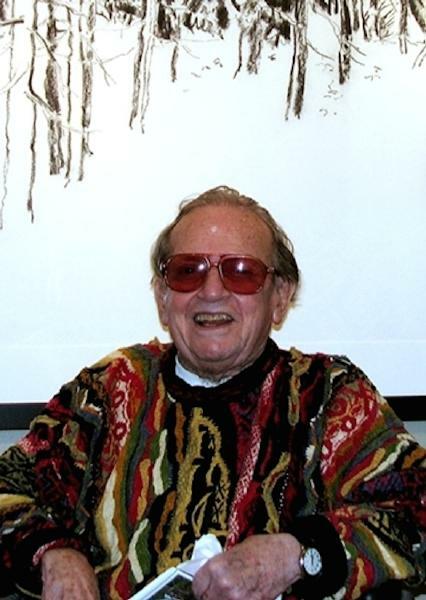 Robert Lyall Flock has had a long and distinguished career as artist and art teacher in Western New York. Upon his return from service as a medic in the Korean War in 1952, he immediately began art studies at the Albright Art School. Later he earned a BFA degree from the University of Buffalo. He taught art in the Kenmore school system from 1960 to 1968, and then at Niagara County Community College until his retirement in 1988. His paintings have been included in numerous solo and group exhibitions, including several at the Albright-Knox and the Burchfield Penney art galleries. This excellent show of superb work continues through October 25. Robert Lyall Flock died on 10 January 2017 at age 88. The following was published online by Kolano Funeral Home: [Died] Robert L. Flock of Amherst, N.Y. January 10 2017 at age 88. Dearest son of the late Baldur and Ruth Flock; survived by many friends, art colleagues and former students that Robert remained in contact with over the years. Mr. Flock taught art at Hoover Junior High, Kenmore, NY, 1959-68 and N.C.C.C. from 1969-1988. He was also active in the art community. Funeral services private. Interment Forest Avenue Cemetery, Angola, NY. Donations in Robert’s memory may be made to the Erie County SPCA. He was interred at Forest Avenue Cemetery, Angola, Erie County, New York. For additional biographical information, see Burchfield Penney Art Center.